Henry Brown found a unique way to escape slavery: He mailed himself to Pennsylvania. In this week’s episode of the Futility Closet podcast we’ll accompany Brown on his perilous 1849 journey from Richmond to Philadelphia, follow a 5-year-old Idaho girl who was mailed to her grandparents in 1914, and delve deeper into a mysterious lion sighting in Illinois in 1917. We’ll also decode a 200-year-old message enciphered by Benjamin Franklin, examine an engraved ball reputed to have fallen out of the Georgia sky in 1887, and present the next Futility Closet Challenge. In 1896 a strange wave of airship sightings swept Northern California; the reports of strange lights in the sky created a sensation that would briefly engulf the rest of the country. In this week’s episode of the Futility Closet podcast we’ll examine some of the highlights of this early “UFO” craze, including the mysterious role of a San Francisco attorney who claimed to have the answer to it all. We’ll also examine the surprising role played by modern art in disguising World War I merchant ships and modern cars, discover unexpected lions in central Illinois and southern England, and present the next Futility Closet Challenge. In 1926, a woman named Lillian Alling grew disenchanted with her life as a maid in New York City and resolved to return to her native Russia. She lacked the funds to sail east, so instead she walked west — trekking 6,000 miles alone across the breadth of Canada and into Alaska. In this week’s episode of the Futility Closet podcast, we’ll consider Alling’s lonely, determined journey, compare it to the efforts of other long-distance pedestrians, and suggest a tool to plot your own virtual journey across the United States. We’ll also learn the truth about the balloon-borne messenger dogs of 1870 Paris, ponder the significance of October 4 to Samuel Taylor Coleridge, and offer a chance to win a book in the next Futility Closet Challenge. As skywatchers prepared for the return of Halley’s comet in 1910, they heard some alarming scientific predictions: Poisonous gases in the comet’s tail might “snuff out all life on the planet,” “leaving the burnt and drenched Earth no other atmosphere than the nitrogen now present in the air.” How should a responsible citizen evaluate a dire prediction by a minority of experts? In this week’s episode of the Futility Closet podcast, we explore the Halley’s hysteria, remember the alarming predictions made for Y2K, and recall a forgotten novella in which Arthur Conan Doyle imagined a dead Earth fumigated by cosmic ether. We also consider the odd legacy of an Australian prime minister who disappeared in 1967, investigate the role of balloon-borne sheepdogs during the Siege of Paris, learn why Mark Twain’s brother telegraphed the entire Nevada constitution to Washington D.C. in 1864, and offer a chance to win a book in the next Futility Closet Challenge. 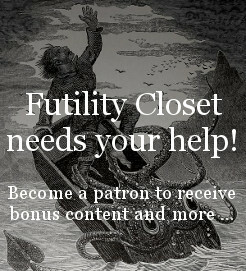 Today we’re launching a weekly podcast, on which we’ll answer listener questions, discuss recent popular posts on Futility Closet, share readers’ contributions on previous topics, present intriguing leads that we’ve encountered in our research, and offer a challenge in which listeners can match their wits. Will New Year’s Day fall on a weekend in the year 2063? If calendar reformer Moses Cotsworth had succeeded, anyone in the world could have answered that question instantly — any of us could name the day of the week on which any future date would fall, no matter how distant. In this first episode we examine Cotsworth’s plan and similar efforts to improve our clocks and calendars. We also look at how an antique dollhouse offers a surprising window into 17th-century Dutch history, explore a curious puzzle in an Alfred Hitchcock film, and invite you to participate in the first Futility Closet Challenge.